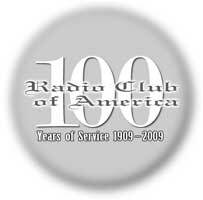 News, information and opinion about the Radio Club of America, the world’s oldest radio communications society. RCA was founded in 1909 by five teenagers with an interest in wireless telegraphy and adults who supported them in their endeavors. This entry was posted on Monday, February 6th, 2006 at 1:11 am and is filed under RCA meetings. You can follow any responses to this entry through the RSS 2.0 feed. Responses are currently closed, but you can trackback from your own site.